news and events and treasures from our archive. enabling them to keep up with the Society's activities. 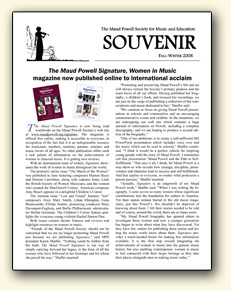 you can sign up for our newsletter, or become a "Friend", or contact us at maudpowellsociety@gmail.com. Click the cover image to view the newsletter in pdf format. The One That Got Away!" Maud Powell Featured among Chicago Symphony's "125 Moments"
Pamela Blevins presents "The Spiritual Voice of Women Composers"
and "The Songs I Had...Composers of the First World War"
"Silent No More: The Woman Composer"